OKLAHOMA CITY (Feb. 2, 2017) – The bombing of the Alfred P. Murrah Federal Building on April 19, 1995, is a part of Oklahoma’s history, and now Oklahoma City Public School students have the opportunity to learn firsthand about the day that changed Oklahoma forever. 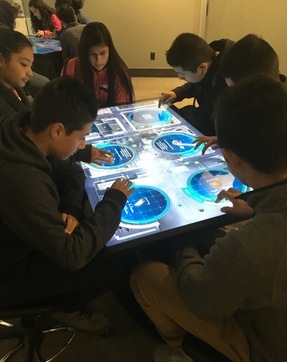 The program, Called2Change, allows every Oklahoma City ninth-grader to experience the memorial, museum and Uncover-Discover STEM lab at no cost to the student or the school district. "For these young students, if they haven’t seen it on video or on their phones, it’s very foreign for them,” said Chris Chris Vandersypen, a history teacher at Southeast High School in Oklahoma City. "It's a great opportunity for our kids to see this stuff firsthand because otherwise, some of them would never have a chance to come here." The program is currently sponsored by OG&E Energy Corp., AT&T Oklahoma and ONE Gas. The Oklahoma City National Memorial & Museum has set a goal of securing additional sponsors so that the program will be available to ninth-graders outside the Oklahoma City Public School district. "It was very emotional to learn everything that happened," said Southeast High School ninth-grader Emeli Morales after touring the museum. To learn more about Called2Change and see the STEM lab in action watch Elevate: Never Forget.